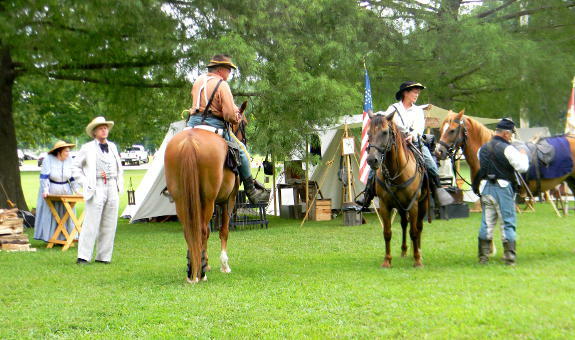 Waynesville, MO: Old Settlers Day Reenactment « The Turner Brigade--Missouri Volunteers, U.S. 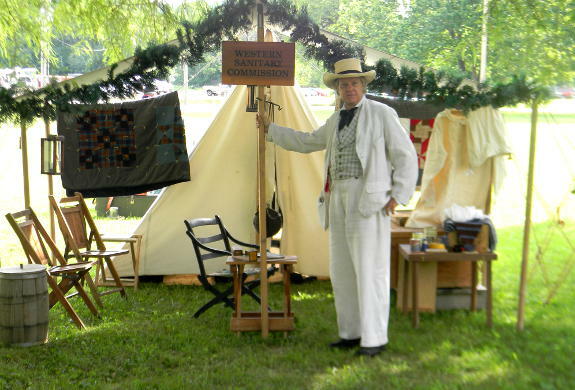 The Pulaski County Museum and Historical Society hosted its 38th annual Old Settlers Day July 28-29, 2018, at Waynesville City Park in Waynesville, MO. Waynesville was occupied by Union forces beginning in 1862. A fort was built near the bluff overlooking Roubidoux Spring. The site was of strategic importance to protect the “wire road” between St. Louis and Springfield, MO, and to curtail regional “bushwhacker” activities. During the occupation the Old Stagecoach Stop served as hospital. Company G Capt. 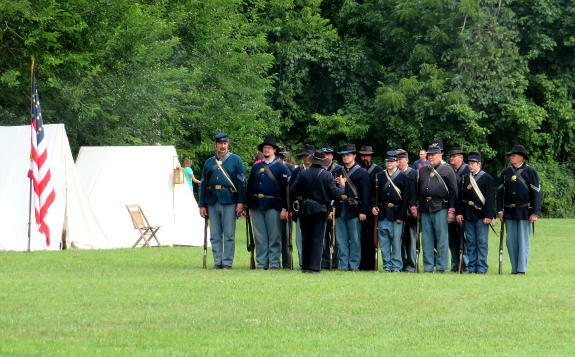 Greg Zelinske reviews the Union infantry in camp at the 2018 Waynesville event. Company M Cpl. 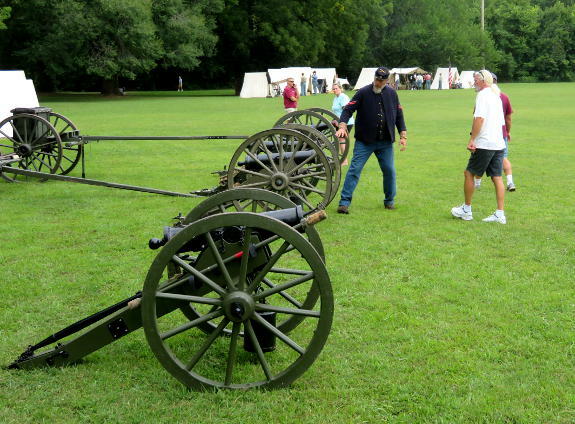 John Pickett explains the workings of a mountain howitzer to a spectator in the artillery park at the 2018 Waynesville event. Company E Sgt. 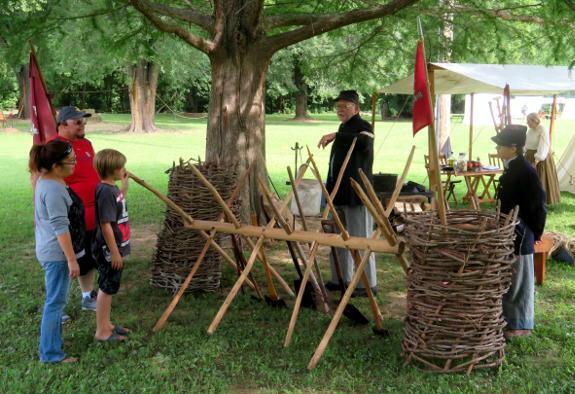 Scott House talks with spectators about how engineers built fortifications at the 2018 Waynesville event. Company M Quartermaster Sgt. 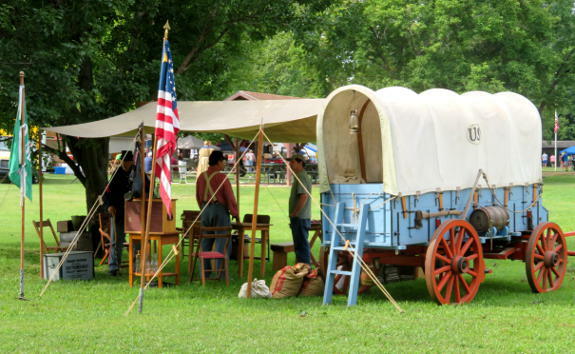 Dave Hagler’s supply wagon display in the Union camp was a popular stop for spectators at the 2018 Waynesville event. Western Sanitary Commission Field Agent Randy Baehr talks with members of Company C in the artillery camp at the 2018 Waynesville event. Western Sanitary Commission Field Agent Randy Baehr poses in front of the display under his fly at the 2018 Waynesville event. 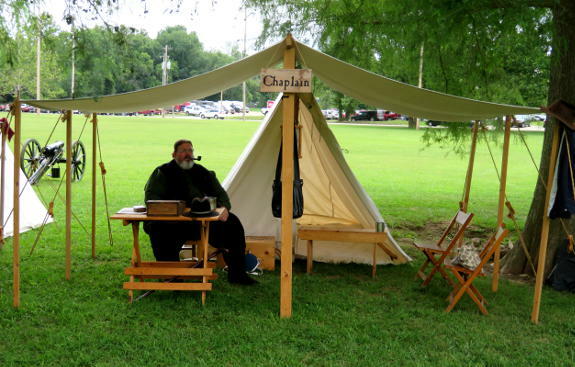 Company M Chaplain Scott Brown smokes his pipe under his fly at the 2018 Waynesville event. 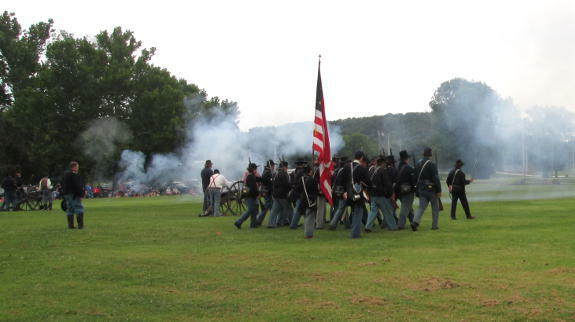 Union infantry passes around the Federal artillery line to attack the rebels at the 2018 Waynesville event. 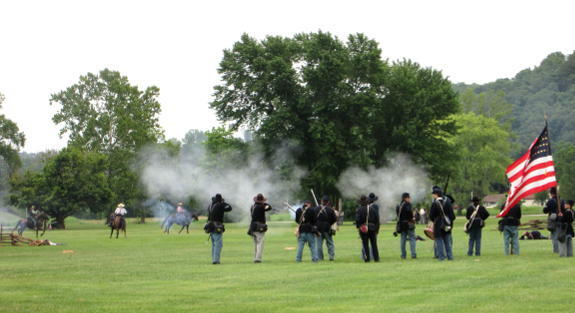 Union infantry fires on the rebels at the 2018 Waynesville event.